Timing a trip to Iceland means weighing several factors: there are the usual seasons to contend with, but also some major fluctuations in daylight hours along with, of course, the seasonal aurora cycle. The weather is most pleasant during the summer months, but the stupendously long days mean your chances of seeing the northern lights are almost non-existent. All in all, getting your timing right is essential--especially if you’re hoping to catch a good light show. The winter months (October to April) bring snow, rain, sleet, windy and icy conditions, dark skies, sub-zero temperatures--with an average around 0°C (32°F)--and less than four hours of daylight. Spring (May) means frequent rain,showers, wind, some ice and temperatures averaging around 5 °C (40 °F). Summer (June to August) is by far the most hospitable weather-wise with temperatures averaging around 12 °C (53 °F) and low humidity. But remember you’ll have less than four hours of darkness at night, so opportunities to catch the northern lights are slim! During the autumn (around September) you can expect rain, wind, light snow and some ice on the roads. The northern lights are sometimes visible during the spring months, but the best times are autumn (September) and winter (October - April). During the autumn and winter months, the night skies are at their darkest, increasing your chances of catching a light show. The aurora is strongest from mid-March to mid-April at the end of the cycle. Arrange at least a 7-day visit to Iceland, because cloudy weather could stay for 3-4 days. December is by far the darkest month, with an average of four hours of daylight,. Take as many photos of the night skies as possible with an SLR camera, because the sky can appear white to the human eye, but cameras will pick up the colours of the lights. Use a tour company that gives you multiple chances of seeing the lights. These companies usually offer to take you out every night for free if the lights don’t appear on the first trip. Follow the aurora forecast closely. Iceland’s aurora forecast (http://en.vedur.is/weather/forecasts/aurora/) is produced by the Icelandic Meteorological Office (MET) and displays a live forecast of the cloud coverage across Iceland. White on the forecast means that there are no clouds and dark green means that the clouds are very strong. 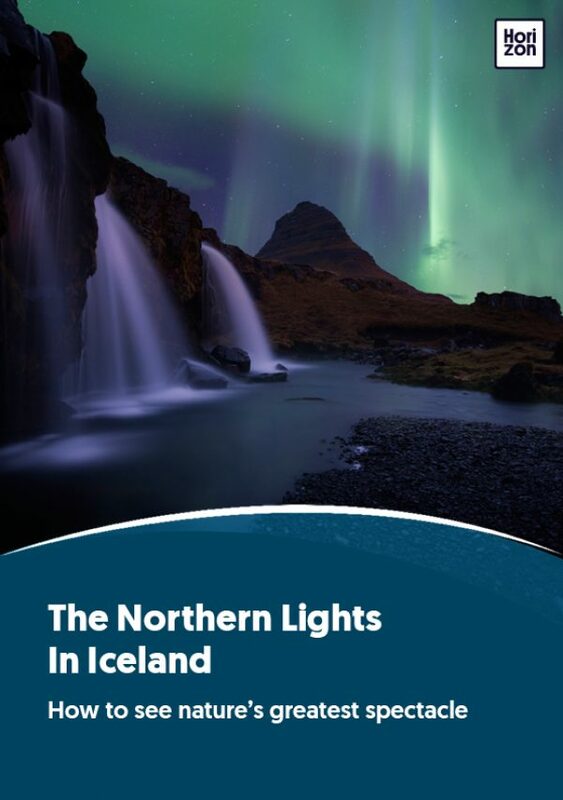 There is also an aurora number between 0 and 9 which symbolises the strength of the aurora over Iceland, with 0 meaning there is no chance to see the lights, and 9 meaning that the lights are strong and visible. The aurora forecast is also available as a regularly updated recorded message by calling +354 902 0600.